Yeah, yeah... FB, I know. Aww, thanks Mamas. I'm really trying not to hope, while hoping all the same, kwim? I've heard so many stories of things being a-ok with spotting, everything settling down, and everyone being healthy. But I've heard just as many stories (and been there 3 times myself before) with spotting being the beginning of the end. Even though that whole part really did overshadow my birthday for me, I tried really hard to put it aside for the kids' sake when they were around and really paying attention to me. And DH was wonderful. About an hour later he walked in the door :wub: He'd told his principal that he was sorry but he needed to leave early and come home to me. So that was wonderful of him. And then he made me fish cakes for supper (:yummy:) and he even had made me a birthday cake! I opened gifts from the kids - really thoughtful ones :wub:, and we had a good evening/bedtime together. Then DH (finally!) got Levi's birthday pics done for me at the same time as doing my cake ones :) I just posted them on my blog if you wanna check them out! Elena :hugs: <sigh>....I have just cried and cried for you. It could still be a sticky bean, it could! Whatever comes, you ARE strong enough to deal with it. you are an awesomely strong woman! I don't blame you about the pill, though, if it came to that. Plus it would give you time to physically heal as well. I loved the cake on your blog. I am ashamed to say I don't read your blog often (or jess or olya's) and I know I should bc they are great! And I don't blog like I should. I have these blogs in my head that I turn into short FB status'. Anywho, happy Canada Day to you and Jessica! K is 13 mo today and I noticed several more words the past few days, like "night night". He was also practicing walking backwards for some reason :headscratch:. He thinks it's funny, so whatevs. I noticed lately, he is back to pacing around. Like if we are watching a movie, he paces around and chatters, comes by for hugs and kisses and goes about his business. Oh about his tantrums, Elena, he can point to what he wants/needs, but his tantrums are bc of things he isn't ALLOWED to have or do, lol. Hope everyone is well, I just got socked in the eye earlier (K was trying to "escape" Hana's clutches and as he was squirming away from him, his forehead met my eye socket and it hurts like a b) so I am expecting a black eye for the weekend, lol. No worries about not reading the blog, lol. I really do it mainly for my parents - if I really thought other people would read it I would start up ads on it and try to make some extra $$! Speaking of them, though - do you have a link to Olya's blog? I loved seeing her beautiful pics when she was still posting with us here, but just followed her sig link and never bookmarked it. Ouchie on the eye - hope it's not too bad a black eye! AFM: We went to the fireworks last night - Levi loved them! He was hilarious before they started - toddling around looking at other people, squealing and giggling, but only going so far from us before turning, waving, and toddling back to us. DH wants to take me (all of us, but the food's for me, lol) for a picnic today - he has salmon and dill cream cheese spread and yummy bread. Not sure what park we'll go to yet. :( Things picked up in the middle of the night - still not quite as heavy bleeding as I was expecting yet, but darker red and more than just when wiping. Kailani liked the fireworks last year at a month old, lol, so we shall see how he likes them on Monday! We read to him a bit, but he likes to look at my books (novels, no pics) on his own. When I read to him he usually grabs the book and throws it at this stage heehee. Thanks for the link, Jul! I meant to say last post - if K's able to get across what he wants and throwing tantrums not about misunderstanding but not getting what he wants... well then I guess there's not much you can do about that one, other than ignore and redirect. Pretty much all I got, lol. Nothing decided about bc or not. I have no idea what I'm feeling right now about it all. More :bighugs: Elena! Hope it is like you said over and done with soon! I still feel like Cooper should have been in the September DDC because he is doing things that those babies are doing. Oh well...all in due time. EI comes wednesday with the PT to re-evaluate him. I still haven't scheduled his hearing test or did the blood work. I just don't want to have him stuck if I don't have too! Tomorrow we drive to NJ for the 4th. Guy's sis hasn't seen Cooper yet. She lives in CA and everytime she would come to NJ we couldn't go. Nevermind that NOBODY bothers to drive to us. :banghead: She totally could have driven to our house from NJ but wouldn't. Kind of bugs me because when DH was previously married his mom and sis used to come and stay with them all the time. :headscratch: We have to take my car and the stupid dogs. Jul ouch about the eye. I remember when my little sis scratched my mom's eye when she was about this age. Not fun. My mom had to wear a patch for a week. Hope it's not black. I really really should read more to Cooper. I want him to grow up loving books. I don't know if we will see fireworks or not I would like to but I am sure we will just sit around and talk about the dogs and let the weekend revolve around them. Really my sis in law is really only wanting to see the new stupid dog. 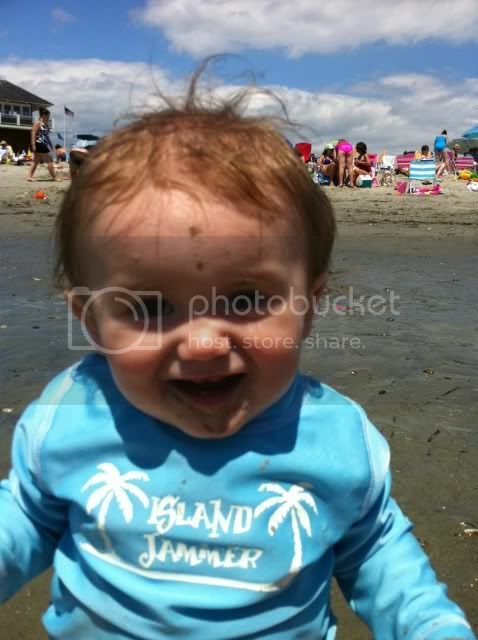 We went to the beach yesterday and He LOVED it! Oh my. 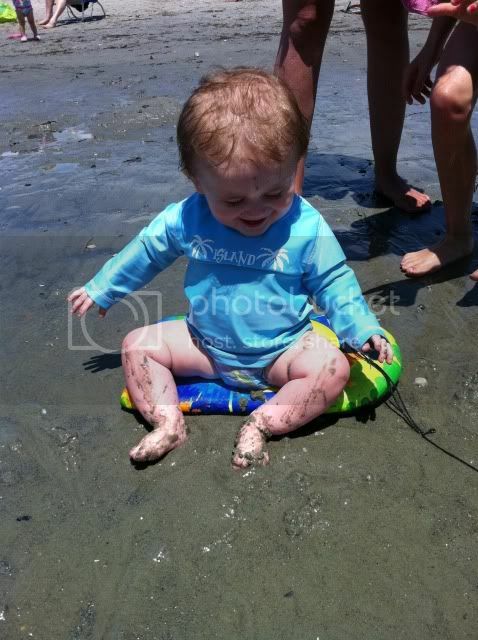 He was squealing when the waves hit him and he was obsessed with the sand! FOund the pics Elena. Those may be the best looking cakes ever!